Oleg Artemyev waved after exiting the International Space Station for a spacewalk on June 19, 2014. Two Russian cosmonauts left the confines of the International Space Station this morning (June 19) to install equipment and swap out parts of scientific experiments outside the orbiting laboratory. 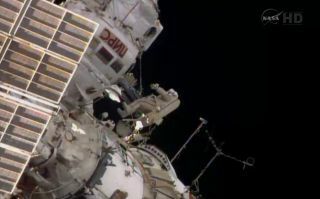 Dressed in their bulky spacesuits, Alexander Skvortsov and Oleg Artemyev opened the hatch of the Pirs docking port at 10:10 a.m. (1410 GMT) to begin their 6.5-hour spacewalk, or EVA (extravehicular activity). You can watch the spacewalk live on Space.com, courtesy of NASA TV. "Oh, that's beautiful," one of the cosmonauts said, taking his first glimpse outside as the station flew over South America. Spacewalking cosmonauts Alexander Skvortsov and Oleg Artemyev went outside the space station on June 19, 2014. The spacewalkers will install new communications equipment, relocate an experiment that studies plasma, inspect latches and gather samples from service module windows, a NASA spokeswoman said during the space agency's webcast. Taking on the role of extravehicular crewmember 1, or EV1, Skvortsov has a spacesuit with red stripes. Artemyev is extravehicular crewmember 2, or EV2, and his suit has blue stripes. It is the first spacewalk for both men. Another EVA is planned for the pair in August. Skvortsov and Artemyev have been living and working on the space station since late March. They launched on their 5.5-month mission inside a Russian Soyuz capsule alongside NASA astronaut Steve Swanson. Three other crewmembers are currently on the station: NASA astronaut Reid Wiseman, European Space Agency astronaut Alexander Gerst of Germany and cosmonaut Maxim Suraev, who all launched to the outpost in late May. The six men make up the Expedition 40 crew. Construction on the $100 billion International Space Station began in in 1998. The orbiting lab, built by five space agencies representing 15 countries, has been continuously staffed with rotating crews of astronauts and cosmonauts since 2000. Thursday's spacewalk is the 180th EVA in support of the station's assembly and maintenance.